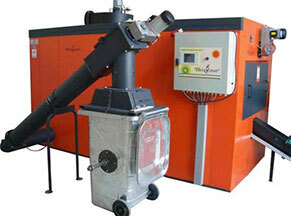 Advanced Wood Heat Econoburn Wood Gasification Boilers indoor wood boilers outdoor wood boilers b.c. 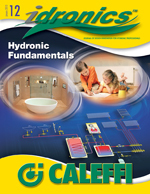 Now carrying a complete line of Hydronic Heating Parts and Accessories. 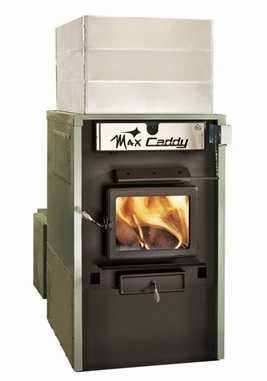 while reducing utility bills by heating with a Wood or Pellet Boiler. with a Wood Gasification Boiler. BC has enacted a law banning the sale and installation of standard outdoor wood boilers as of March 1st 2017.
will be available for purchase in BC after that date. Biomass heating has been a reliable option for heating for hundreds of years. Diminishing ressources and exponential growth of fossil fuel costs has renewed interest in heating with wood, pellets or waste biomass products such as wood chips. This heating method allows for significant savings on heating costs over traditionnal fossil fuels. It also represents a promising alternative to fossil fuels as biomass fuels are readily available across Canada, as well as being both renewable and locally sourced. Heating with biomass can provide people with a level of independence from utility companies and big oil and gas. The increased interest in wood heating along with the reinforcement of strict environmental policies has also contributed to improving the available technology and considerably increase biomass boiler's efficiencies. A wood boiler uses combustion to heat water that will then be distributed to meet the demands of different heat loads: radiant floors, radiatiors, water to air heat exchangers, domestic hot water, pool, spa, etc. 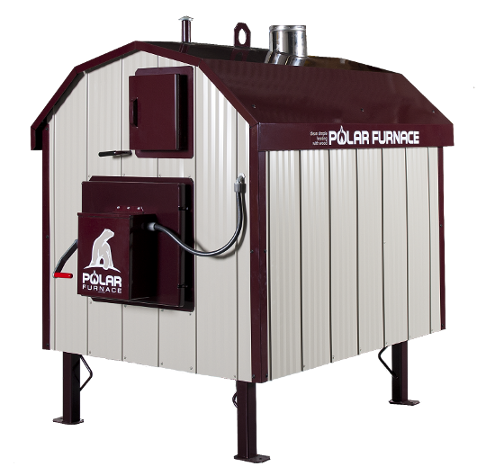 Installed in a mechanical room, basement, garage or shop, indoor boilers allow one to burn wood and pellets from within the building. 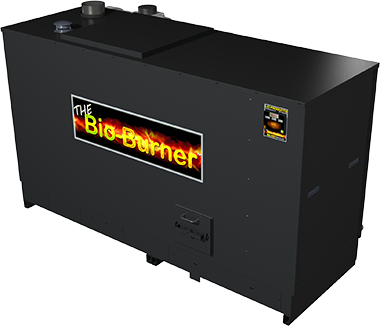 With a very high efficiency in the combustion process these are the most efficient gasification boilers and they meet all of the latest EPA standards. 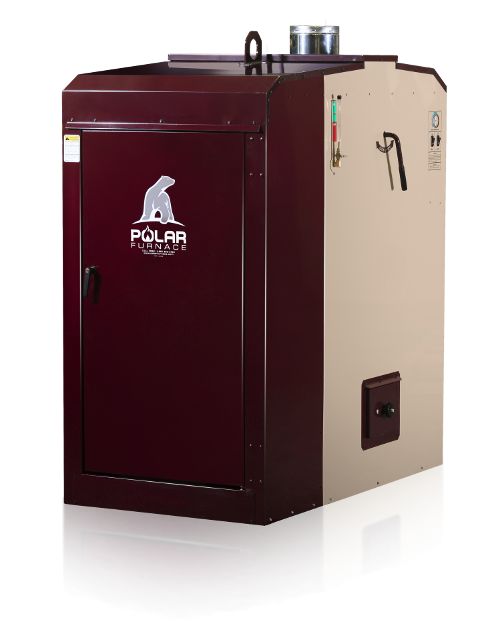 These boilers are the cutting edge of biomass technology and represent the future of biomass heating. Heating with biomass and thermal storage also provides the possibility to combine other renewable heating sources such as solar heating systems. Finally, new technologies allow for automatic operation and feeding of the boilers, which eliminates a negative aspect of this heating method. 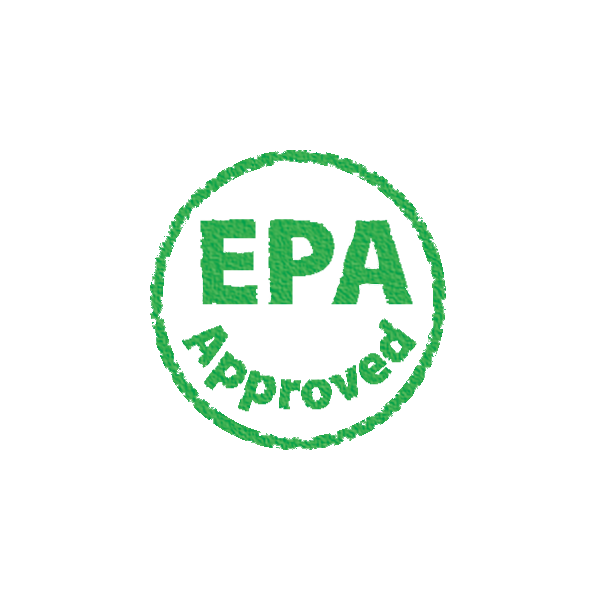 The different models being EPA certified also allows for home owners in urban areas to consider this heating source if local bylaws permit. When wood is heated, it begins to breakdown, changing from a solid into a gas. The wood ultimately changes to charcoal. 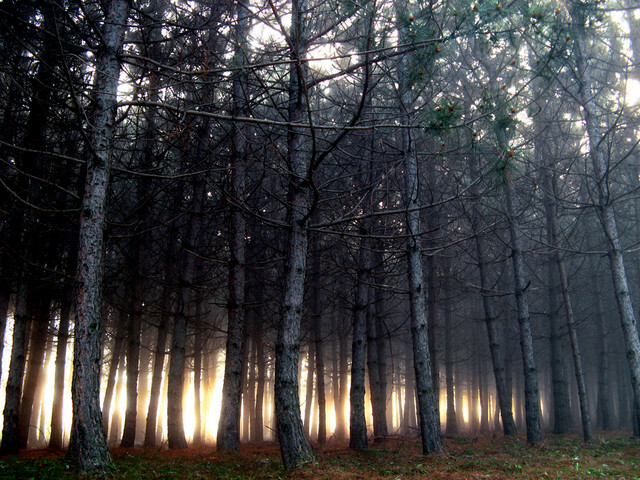 The gases emitted by the burning wood are mostly comprised of hydrogen (H) and carbon monoxide (CO). The emission of gases as a result of heating is called gasification and the unburned hydrogen and carbon monoxide gases, along with others, are often called soot, creosote, and tar. If the boiler is not specifically designed to burn these gases they simply escape up the chimney, this is why we sell only the most efficient wood gasification boilers..
Only 20% of wood's heat potential is generated by burning the solid mass (actual wood). 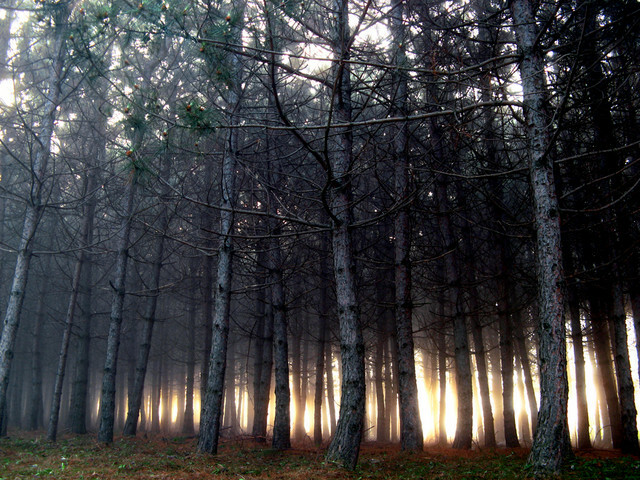 The remaining 80% of wood's heat potential is generated by burning the gasses created while the solid burns. Boilers: outdoor or indoor, this is the heat source for the system. The combusstion generally occurs in the secondary combustion chamber and is called gasification combustion. In this type of boilers, the wood gasification technology provides combustion at very high temperatures and provides much better efficiency and fewer emissions compared to traditionnal wood boilers. Underground piping : For outdoor systems, a double, insulated pex piping line has to be used to bring the heated water to the storage and distribution system located inside the building. 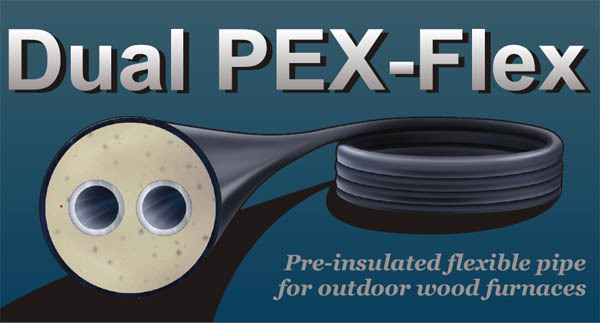 The choice of quality insulated piping is very important to limit the tremendous amount of heat loss that can happen in frozen ground between the outdoor boiler and the building during winter months, therefore greatly reducing the system efficiency. Storage or Buffer tank : Once heated, the water is best stored in a tank before being distributed. The buffer tank is therfore a very important part of the system as it allows a buffer zone between the heat production, that generally happens during the day and the heat distribution, that is generally consumed later in the evening and at night. The buffer tank also allows for less cycling between burns and streamlines large temperature differences between loads. Finally the buffer tank also allows for the integration of different input and outputs to the system: electrical boilers and solar heating systems can be integrated for backup and summer heating and domestic hot water use. Heat Distribution : From the buffer tank, the heated water can be distributed througout the buildings using three methods, radiant floors, radiators or panels and through a water to air heat exchanger used in conjunction with a hot air furnace or fan coil. The hot water produced from the boiler can also be used for domestic hot water heating, spas, hot tub and pool heating. 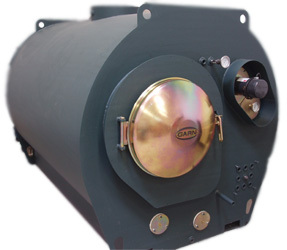 The wood boilers we sell are garanteed for a period of 10-25 years under manufacturer's warranty. The boilers life expectancy will depend on many factors such as: wood / pellet type used and it's humidity content, maintenance schedule, water / glycol used etc. Properly managed maintenance and upkeep will usually provide a life expectancy of around 20 years. Regular maintenance will greatly prolong the life expectancy of wood, pellet or biomass boilers. We suggest regularily scheduled maintenance of your system according to the manufacturer's recommandation to insure proper coverage of your system. Most of the maintenance can be handled by the owner or by a qualified professional. Biomass boilers and heating system sizing is for the most part done the same way that of a traditionnal system. 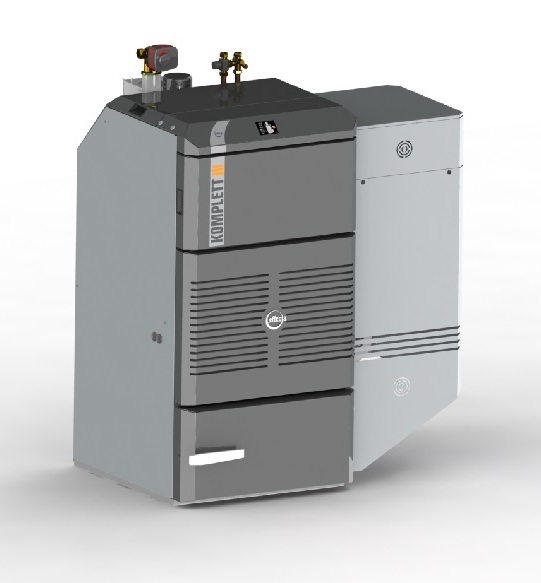 The chosen model will be a calculation between the heat loss of the space to be heated and the efficiency and rated outputof the chosen boiler. 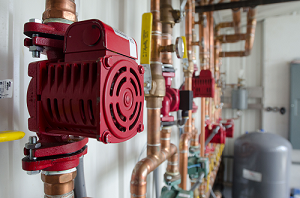 We can help you determine the proper sized boiler for your home or project and can also offer hydronic component design so that your system works properly and is easy to maintain. Check out the E.P.A. 's list of Best Burn Practices for specific information. Best place to learn anything and everything about Wood Gasification Boilers. We also supply these great products.